Howard Beach, Queens County, New York. Just outside of New York City (NYC). Home to Russo’s on the Bay and Vetro. Home to some of the finest catering and service available at any wedding reception venue anywhere. I’ve been creating great wedding photos at Russo’s for decades, an experience that I always welcome. The food is out of this world, the service is impeccable and the architecture makes for some of the most elegant wedding pictures. This picture was taken at Vetro, just a minute or two south down Cross Bay Blvd. from Russo’s. This amazing couple was so animated and loved taking every one of their wedding photographs. 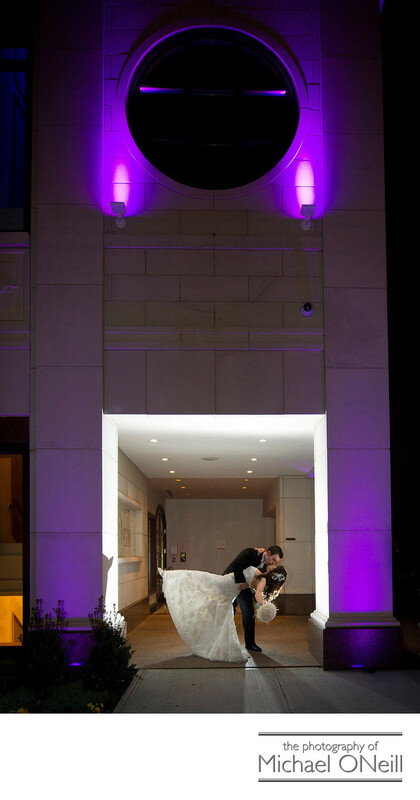 This dramatic, romantic image was created in the entry to Vetro at night. While the wedding guests and bridal party were inside I slipped out the front door with the bride and groom, took this picture and had them back inside with their family and friends in less than a minute’s time. I make it my mission to insure that my clients get to enjoy every minute of their wedding days. If you are planning a wedding reception at Russo’s or Vetro give me a call so we can talk about all your plans for the big day.